How to Write a Funny Wedding Toast | Wedding Ideas ARE YOU A VENDOR? Want to make guests laugh out loud with a funny wedding toast? Follow these pro tips and you’ll have no problem penning something truly hilarious. Have you been blessed with the honour of giving a speech at your best friend’s wedding? Congrats! Clearly the happy couple thinks pretty highly of you. 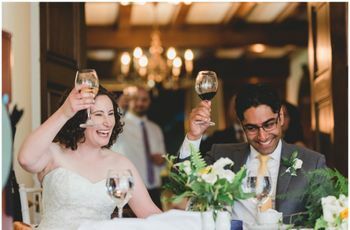 Now, their parents will probably take care of giving the sappy and sentimental speeches, so you may want to go with a funny wedding toast for yours. 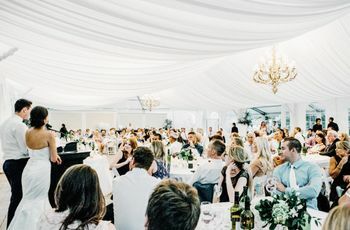 If you want to deliver a hilarious (and also heartwarming) wedding speech, read on. Here’s how to write a funny wedding toast. Every comedian needs something to feed off of. Dedicate a day to hunting for inspiration in Netflix specials, movies and shows. A bit of Dave Chappelle or Amy Schumer may be just what you need to get started. When giving a funny wedding toast, don’t let your jokes drag on. Remember, this isn’t your own comedy special, it’s your friend’s wedding, so you don’t want to monopolize the mic. Your toast should be around two or three minutes long (five max), so plan accordingly. Want to give your speech a bit more dimension? Get the other guests involved. Use lines like “can I get a show of hands...” or “clap if you…”. You can even single people out (as long as you’re nice about it). 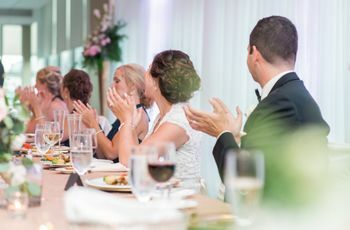 If you’ve been given the task of giving a toast at the wedding, you probably know the bride or groom (or both!) quite well. Take a walk down memory lane and think about including a particularly funny story from your past - stories about when you first met and practical jokes you’ve played on one another make for great speech content. You don’t want to ruin the happy couple’s big day by bringing up something super embarrassing, but you can tease ‘em a bit. Throw in a joke about their less-than-impressive high school haircut or a blunder they made in front of their first crush in Kindergarten. 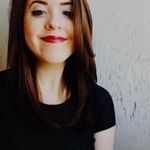 Keep in mind that you don’t want to spotlight any uber embarrassing tales or something that could get your friend in trouble with their new spouse (no mention of exes, please). Got a hidden talent? Use it when giving a funny wedding toast. Everybody loves when Seth MacFarlane, James Corden and Jimmy Fallon throw a bit of singing into their routine. Give your speech a visual component by sharing some throwback photos (you can usually dig up some pretty hilarious ones from back in the day). 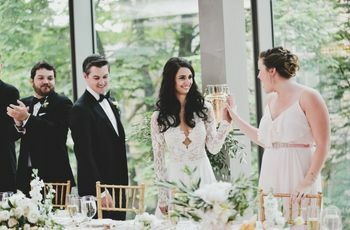 You’ll want to make sure that the wedding venue has a projector and screen available so that the whole audience can get a look. This is especially important if you’re speaking to a crowd of hundreds. If you rush through your jokes at the speed of light your audience may miss them, so slow your roll. Give time for them to react by pausing between jokes. If you need a lesson on how to get your timing just right, spend an evening watching stand-up routines on YouTube or Netflix. The pros have got it down to a science. 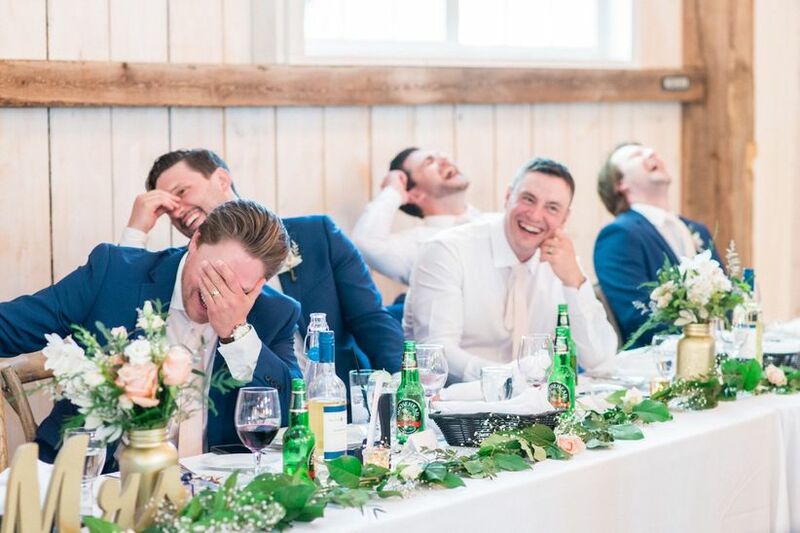 Obviously, we think funny wedding toasts are a great idea, but you shouldn’t make it all about the jokes. You’re going to want to infuse your speech with a heavy dose of sentimentality, too. Once you’ve finished sharing funny stories and uttered your last one-liner, say something sweet to the couple (make it really tug on their heartstrings). All that’s left to do after that is raise your glass of champagne and toast to the couple’s bright future together. When it comes to jokes, timing is everything. Give your speech a couple of solid run throughs in front of an audience so that you know what works and what falls flat. Keep in mind that while you don’t have to have your toast memorized from beginning to end, the less you have to read off of paper, the more natural it will sound.